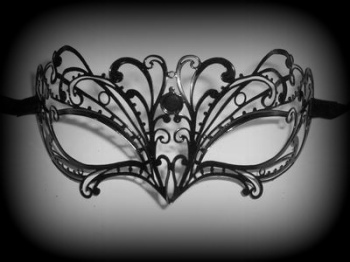 If you’d like to wear the mask of a celebrity then browse through our Filigree Collection and expect to feel spoilt for choice. These ultra light weight filigree masks are created from laser cut metal to give the appearance of ornate lace. Every mask in the Filigree collection is hand-made in Venice, northern Italy, the city famed for its elaborate masquerade masks. Choose between the lacy metal gold, blue, black and silver masquerade pieces we can offer you, some of which are adorned with real Swarovski crystals. If you are wearing a masquerade mask for the first time we think you’ll be tempted by the glamour afforded by the filigree designs. Try our gold and Swarovski crystal filigree piece in the style worn by Serena in US Drama ‘Gossip Girl’ and be the star of the silver screen at your masquerade ball.